We finally got it installed, it took some dawdling right through Winter, but the heating solution of our desires (well, for our existing home anyway) was finished just in time for Spring :D. I can’t remember when we started actively looking for a heating solution, I’m thinking it was the middle of July or something and we weren’t sure which solution we wanted. But it pretty much came down to gas ducted heating (in the roof because we have a concrete slab underneath) or hydronic heating with radiator panels in each room. If the ducted heating could also be used for cooling in Summer we might have gone with that but since it could only do heating, we went with the nicer solution (IMO). If you do your research, you’ll probably come across the same stuff that I did in terms of what to expect for hydronic. I contacted a couple of heating companies that I’d seen around the place, and they happened to do both, but not really liking the quotes we received from them, I decided to look for some hydronic only companies (as we were leaning that way after those early quotes). I think I contacted most of the ones in Melbourne, I don’t know if it was because it was peak season, but just getting a response proved difficult. What usually happened was that I’d call the company, they’d pick up and say the person I needed to talk to wasn’t in, but they’d get back to me, just leave your contact details, only to never hear back. So I tried another tact, most of them have online quote forms on their web sites, so I submitted the forms with a picture of our floor plan and waited for responses that way. I think I got a response from half of the companies I contacted, and only usually after a week or so. 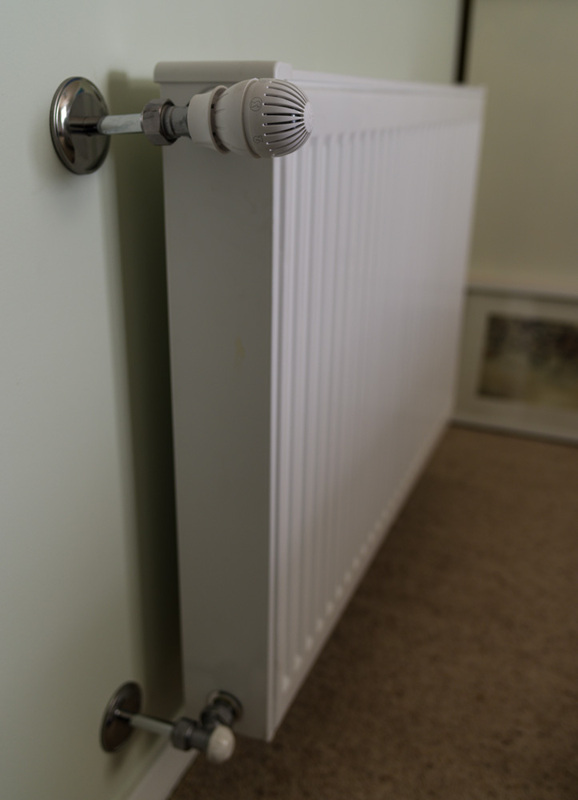 After all the rough estimates had come in (as they could only go by our floor plan) and we dissected the details, boiler brands, pipe brands, radiator brands, warranties, included and excluded work, we came to the conclusion that Foster Hydronic Heating provided the best quote. I was a little hesitant at first because I called them initially and spoke to someone to come out and give us a quote, but when the day arrived, the guy never showed. This time I called them and told them that we were keen but that we’d need someone to come out to make sure that everything was good, and wouldn’t you know it, someone showed up close to on time. Foster use Bosch everything basically, which is one of the major brands in this business from what I have read, in terms of boilers, I read about Sime, Baxi, and Immergas being the other popular brands, and Delonghi being the other radiator brand. Having finalised the plan we waited for the install date, which would be split over two days, the rough-in (plumber speak for pipe work I guess), and the boiler/radiator install. In between that we’d have to find a plasterer to patch up the holes left behind and then paint the walls (ourselves) and trim where the radiators would go. The pipe work went pretty smoothly but they did leave a couple holes in a couple spots that were a bit bigger than the cover plates so we’ll have to get the plasterer to fix them up down the road. Another quip that we had was that we asked for the position of one of the radiators moved on the original plan, which they agreed to, but as we didn’t confirm or chase it up to get the plan changed, the installers ended up installing it in the same place as the original plan. The plastering took four days (an additional day was required due to some bubbles in the plaster) but we had a week and a half between the pipe work and the radiator install so time enough to get that done, but I did have to take a very long day off work to get all the painting done. 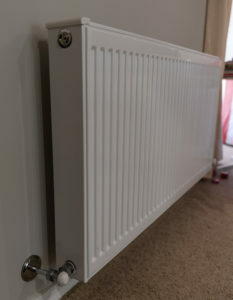 You can probably tell from the pictures though, the amazing paint job I did which makes the radiators look even more amazing. The modernisation and transformation of our house has certainly started, and I hope we can keep the momentum going. It took a day to install the boiler (we got the condensing 30kW) and the radiator panels, but it certainly didn’t take that long to know that we went with the best solution in the end. It heats up quite quickly (we got eight panels, skimped on the entry and laundry due to budget constraints) and the bedrooms even come with thermostatic control valves (the knob at the top of the last picture) that we can use to reduce or increase the heat of those radiators specifically. 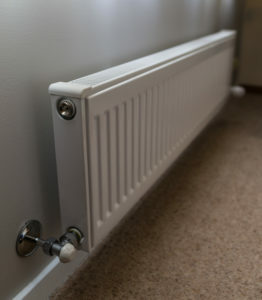 They can be hot to touch while heating up but they won’t burn you unless you leave your hand there, once the house has got to temperature though, the radiators cool down though. As an added bonus now our towels can be warm for morning showers (not sure if this is recommended though :D). 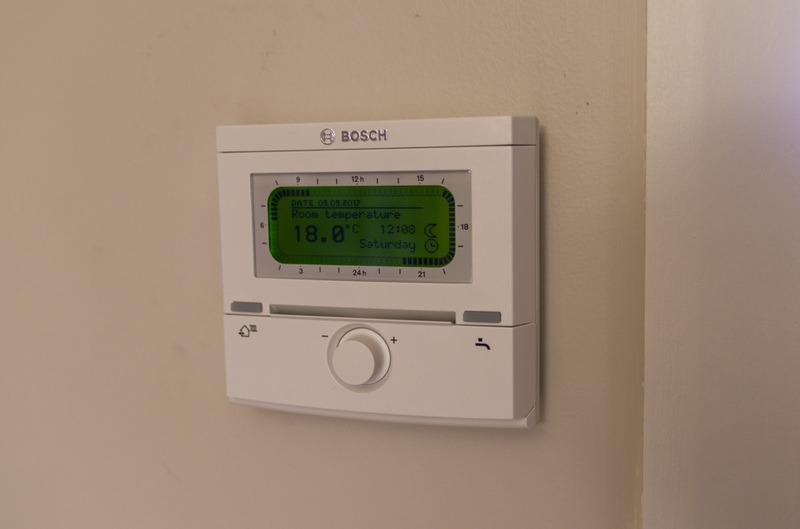 The Bosch controller allows us to set the heat to come on automatically at set times any day of the week, or all, or weekends, etc., set a minimum temperature outside of those times, and another minimum temperature for when the system is not on automatic, there are some other features but they’re not important. Just know that you can control the times and temperatures of the radiators to a pretty good degree. It’s so warm we even had an unwelcome visitor the other day, a big, bloody mosquito.